Traumatic Brain Injury (TBI) is the leading cause of central nervous system impairment. TBI remains a “silent epidemic” due to the low awareness despite its high prevalence. TBI is caused by a hit to the head that causes immediate physical damage to brain tissue. TBI exposes the healthy part of the brain to metal ions, free radicals and cell inflammation. This exposure sets off a chemical reaction that damages more brain tissue than the original trauma itself (secondary injury). Standard TBI diagnostic tools are based on computed tomography (CT) scans, magnetic resonance imaging (MRI) scans or neurological examination which are not always accurate to correctly diagnose mild and moderate cases. This puts the patient at risks such as long-term consequences of untreated TBI including headache, dizziness, irritability, anxiety and depression, as well as premature development of chronic neurodegenerative conditions such as Alzheimer’s or Parkinson’s diseases. Neurologic assessment scales are either insufficient, too coarse, or prone to interference for diagnosing mild TBI. Inadequate approaches to diagnosing mild TBI rises the need for significant improvement in the detection and classification of TBI, such as the use of biomarkers to supplement diagnosis. An alarming number of people fail to get a proper TBI diagnosis. Failing to diagnose TBI prevents the patient from getting proper treatment, and it predisposes to a second, more serious injury. Concussions happen often in contact sports due to collisions with other players, hit to the ground or with equipment. Sports and recreational activities contribute to about 21 percent of all traumatic brain injuries among American children and adolescents. Suffering another mild brain injury on top of another has accumulative effects, meaning it exposes to a significantly increased risk of serious damage. It can lead to disability and even death. This is why detecting and diagnosing primary TBI is especially important. Athletes who continue to play, even for a few minutes, after sustaining a concussion, take twice as long to recover as those who come off the field and stop playing immediately. Similarly, those who return to a contact sport before they are fully recovered are more likely to have a prolonged and only partial recovery. Unfortunately a lot of cases go undiagnosed and untreated. Traumatic brain injury in children is a growing concern. Children are the most prevalent age group suffering from TBI. They have a large head compared to rest of their body; less myelinated brain cells and thinner cranial bones, and they are prone to falls during normal play. Falls are the most common reason for brain injuries. The damage will disrupt learning and performance in school. It can even lead to socio-economic difficulties in the child´s future. Children are also the most hardest to diagnose. They cannot communicate their symptoms until they reach the age when they acquire the ability to speak, and even then they are unable to properly describe their condition. They are also under an increased risk of receiving lethal malignancies from the radiation of the CT scans. A US study estimated through the NEDS (Nationwide Emergency Department Sample) database that between 2006 and 2013 total of 6,089,930 children were diagnosed with TBI. Another US study found that in 2007 children under 14 had a total of 460,000 visits to the ED, and in 2013 the number was 640,000. The median age group is between 0 – 4 years! A number of studies has reported a rising trend in the numbers. Many biomarkers have been suggested for TBI but only one blood based biomarker protein test has resulted in an approved test. 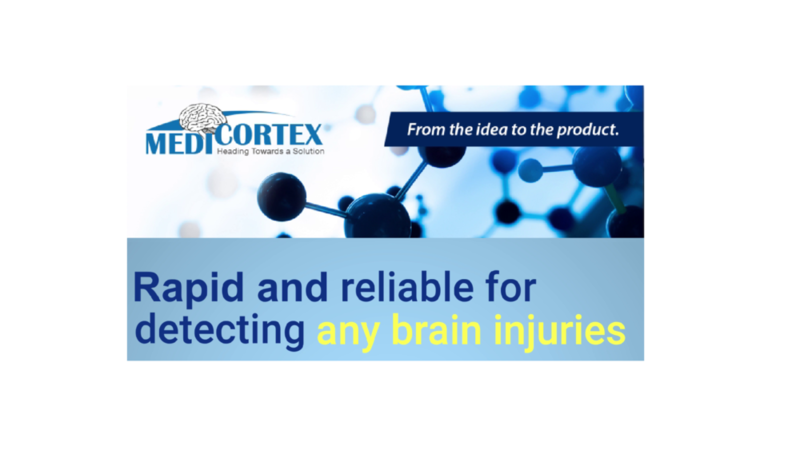 We have already proven that our biomarker is strongly correlated with TBI, allowing us to address a TBI point of care (POC) diagnostics market that will exceed €2 billion annually. An example of a wrong return-to-play decision happened when Victoria Azarenka, a 21-year-old tennis player, collapsed in the US open midgame. She had suffered a head injury before the game while warming up. She had been examined by medical personnel just before the game who didn’t find anything wrong with her. She was later diagnosed with mild concussion. Repeated concussion cases are more serious but less recognized since the earlier trauma is probably unreported. A high school senior football linebacker was injured in a game on Nov. 1, 2012. The injury was diagnosed as a brain bleed. He collapsed on the field and later had emergency surgery. He had a concussion earlier in the season and had to sit out one game before being cleared to play by a physician. Recovery was incomplete, however. Michael Pennerman, 16, was tackled in a football game and walked off the field. He told his coach that he felt like somebody was pulling him to the ground. He then fell flat to the ground and died the next day. Reportedly he took many hits during the same game. So he might have suffered an earlier concussion, which combined with the hard tackle, resulted in the fatal outcome. Tyler Lewellen, 16, collapsed on the sidelines of a football game during a scrimmage suffering a severe brain bleed. CT scan revealed trauma and cerebral swelling. He died five days later. The doctors speculated whether the injury was a “second impact” on top of a previous undiagnosed concussion.